For more, see the gallery of Al-Mutanabbi Street Broadsides. In March 2007 a car-bomb suicide attack destroyed the entire perimeter of Al-Mutanabbi Street, the heart and soul of Baghdad’s intellectual and cultural community for centuries. Responding to this tragedy, artists from all over the world have come to share a sense of solidarity as well as ownership in a project that refuses to let that day, and its significance, ever be forgotten. Like many Americans, and thousands of writers around the world who stood by and watched helplessly as the U.S. invasion of Iraq began on that fateful day in March 2003, I had struggled to make sense of and grasp the destruction heaped upon that nation as a result of this war. Although the official reasons (Saddam’s so-called “weapons of mass destruction”) for the U.S. involvement in Iraq had largely been discredited by 2010, it also seemed everyone had forgotten about the war, forgotten about Iraq and its people. But that afternoon in Washington, D.C., seven years after the war began, those of us in the room at Busboys and Poets lived the moment with Mousa al-Naseri. I understood the profound importance of Al-Mutanabbi Street Starts Here and why I had become involved with this project. Even now, after President Obama declared the eight-year American war officially “over” in October 2011, the lingering economic, political, and psychological effects of it continue to take their toll. How could it be otherwise? I have never forgotten this man and his vivid description of that day. It lingers with me still. An essay by Mousa al-Naseri, on his connection to Al-Mutanabbi Street, is now included in the Al-Mutanabbi Street Starts Here anthology. At the height of my own sense of helplessness at understanding the destruction that the U.S. invasion and occupation unleashed, I found a voice in the Al-Mutanabbi Street Coalition in the summer of 2007. Like the founder of this coalition, Beau Beausoleil, I vividly remember reading the news headlines in the New York Times about the bombing on March 5, 2007. The car bomb, which was a suicide attack, destroyed the entire perimeter of one of Baghdad’s oldest and most revered neighborhoods, Al-Mutanabbi Street. Thirty people were killed, and more than one hundred were injured. Although the loss of life was in itself devastating, the symbolism of the street was not lost on Iraqis. Al-Mutanabbi was the heart and soul of Baghdad’s intellectual and cultural community for centuries, and despite years of dictatorship and repression, it remained the place where all Iraqi writers and books could breathe in an atmosphere of relative freedom and human exchange. The stores and stalls that lined Al-Mutanabbi composed a physical world of words and paper where people could buy, sell, and trade books (new and used) freely (and sometimes clandestinely) and traffic in the world of ideas, regardless of how threatening or radical they may have been to the government. To many Iraqis, Al-Mutanabbi Street was much more than a neighborhood, more than its shops; it was an intellectual capital for Iraq. Poets, writers, intellectuals, and political dissidents gathered in local cafés and bookstores to share magazines and books and to debate and discuss politics and culture about the entire Arab world. It was the place that Iraqis frequented during some of the most tense and difficult periods in recent Iraqi history, including the years of the Iran-Iraq War (1980-88), the long years of U.S. sanctions that brought devastating shortages (1990–2003), and before and after the fall of Saddam Hussein and the arrival of U.S. troops. Al-Mutanabbi Street’s name honors the much-beloved and revered tenth-century Iraqi poet Abu at-Tayyib Ahmad ibn al-Husayn al-Mutanabbi, whose poetry is still recited throughout the Arab world. Al-Mutanabbi himself died in 945 because of some lines in a poem he wrote that caused insult. The injured man sought to end al-Mutanabbi’s writing career, despite his popularity at the time. That a street in Baghdad had survived centuries of warfare, political abuse, and dictatorship made it all the more significant when the car bomb devastated the area and the entire neighborhood erupted into flames. Those who would take away the rights and dignity of a people with the very same words that guarantee them . . .
And to anyone who would view the bodies on Mutanabbi Street as a way to narrow the future into one book . . .
That Mutanabbi Street starts here. After the reading, I introduced myself to Beausoleil, and like many others, I was inspired to participate in what would later be called the Al-Mutanabbi Street Coalition. 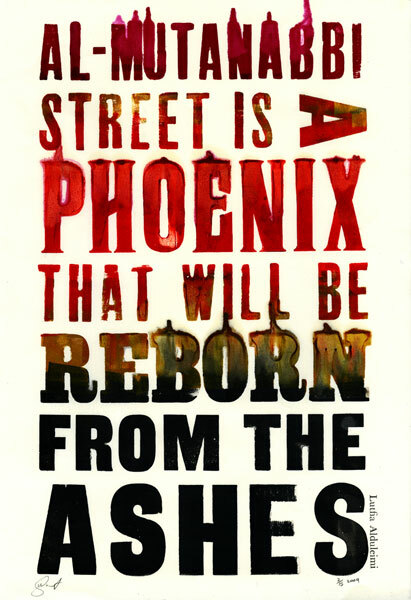 What started as a call for poets and writers to write and read poems in April 2007 in memory of those who lost their lives on Al-Mutanabbi Street quickly morphed into a call to letterpress printers to produce a visual response to the attack. The response Beausoleil received was immediate and overwhelming, with over forty letterpress printers responding with powerful and evocative broadsides based on their responses to the bombing or incorporating poems written about the war or the Al-Mutanabbi bombing itself. 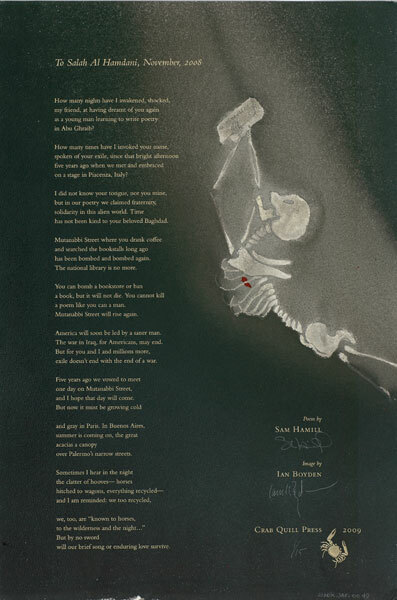 Many of the now 133 broadsides are breathtakingly beautiful and have incorporated lines from the poet al-Mutanabbi’s verse or poems by contemporary Iraqi and American poets. 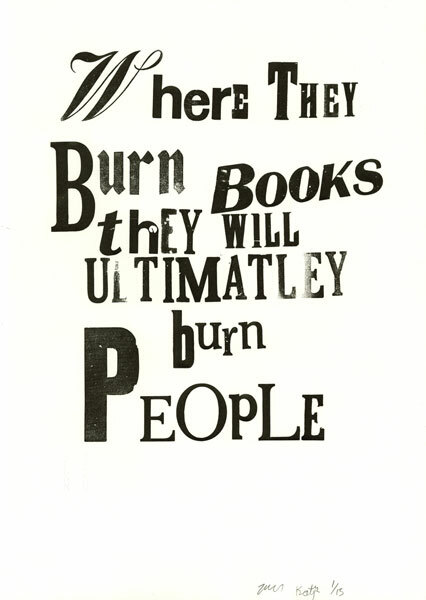 The entire collection of these broadsides is now digitized and available at Florida Atlantic University’s Jaffe Center for Book Arts website (www.library.fau.edu). The reading I attended in 2007 at the San Francisco Public Library was the first of many memorial readings still held around the country every March in cities like Boston, Los Angeles, and Washington, D.C. Since 2010, cities in Europe—London and Dublin—have also hosted readings, and Amsterdam hosted an exhibit of some of the broadsides. Since that first reading, Beausoleil has hosted his own memorial reading around the anniversary of the Al-Mutanabbi bombing in his cozy, two-story Great Overland Book Company in San Francisco; each time he shares more about the dynamic and powerful project that includes local and nationally celebrated poets and writers from around the world. The Al-Mutanabbi Street Coalition has now evolved and morphed into an organization—if you can call it that, since it operates loosely by a kind of goodwill-based and largely independent coalition of 450 book lovers, artists, letterpress printers, book artists, and cultural workers from twenty-one countries, some of whom live in Iraq. They have come to this project with the vision that Beausoleil brought to it originally: to respond, reflect, and express through art a much larger and human connection to others who have been rendered voiceless by war and violence. The coalition has moved beyond its early mission to respond to a single, indelibly notorious day of death and destruction, into a cultural initiative that celebrates words, books, ideas, and the way they connect us. The coalition, which now goes by Al-Mutanabbi Street Starts Here, has evolved since 2007 to include four areas: (1) the collection of more than 133 broadsides, many of which have traveled around the world in exhibitions and have been sold to raise money for Doctors Without Borders; (2) an anthology of poems and essays, Al-Mutanabbi Street Starts Here, edited by Beau Beausoleil and Palestinian American poet Deema Shehabi, which features the writing of Iraqi, American, and other international poets and writers in response to the bombing (forthcoming in June 2012 from PM Press); (3) a collection of over 262 handmade books by artists that “hold both the memory and the future of the Al-Mutanabbi Street bombing”; and (4) readings, exhibitions, and cultural events that continually emphasize, long after the bombing, the important role that cultural centers and spaces of literary and intellectual encounter play in our lives. Exhibits of the Al-Mutanabbi Street Starts Here broadsides have been shown in universities, galleries, and state institutions and museums such as Gallery 31, which is associated with the Corcoran School of Art and Design in Washington, D.C. The project appealed to me because Beau’s primary vision creates a “clearing” of sorts; this clearing has become a space for memories, for grieving, for acknowledging our human commonalities through shared histories of violence, and, ultimately, for regeneration. I am only now beginning to understand how regeneration from destruction is so embedded in Iraq’s cultural ethos. By building these connections through the written word, the project has been immensely successful in creating a deep cultural literacy, a literacy that will resonate for years to come. For me, the project remains in its essence about upholding the Iraqi cultural community’s steadfastness in the face of destruction. In addition to asking individual poets to invite other poets to contribute to the anthology (serving as kind of section editor), Beausoleil has recruited a number of dynamic and energetic artists, including Sara Bodman from the Center for Fine Print Research (cfpr) in the UK, to co-curate An Inventory of Al-Mutanabbi Street, a project to “reassemble” some of the “inventory” of reading material that was lost in the car bombing. Bodman has helped contact artists, organize exhibits, and get the word out about the project in Europe (to view some of the Al-Mutanabbi books, see www.bookarts.uwe.ac.uk). 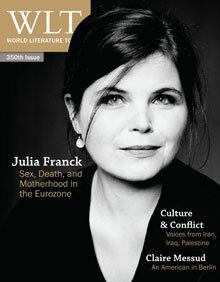 Eventually, when the project is completed in fall 2012, a complete set of 262 books will exhibit worldwide in 2013–14 and then be sent as a gift to the Iraqi National Library in 2015. At the most recent commemorative reading in San Francisco on March 2, Beausoleil paid a special tribute to American journalist Anthony Shadid, who had covered the war in Iraq throughout the past decade and died in February while on assignment in Syria (see WLT, March 2012, 50–55). Beausoleil spoke of the ways that Shadid had championed the Al-Mutanabbi Street project and put him in touch with the director of the Iraqi National Library. Beausoleil’s ultimate vision for this project is to someday return the books, broadsides, and anthology to the Baghdad library so that Iraqis themselves can see them and know they were not completely alone and that others understood their suffering. “It is my dream to go to Baghdad and present these broadsides and books to the Iraqi National Library and then sit down at the rebuilt Shabandar café on Al-Mutanabbi Street and speak with the writers and poets who frequent this neighborhood,” he says. To have this project reach back to Baghdad and to Al-Mutanabbi Street is one of the goals that Beausoleil envisions for this project, which now relies on the energy, vision, and interest of its many “members,” who live in places as diverse and far away as San Francisco, Amsterdam, Baghdad, Omaha, and Santa Fe, and who, despite the short memory that most Americans have of the long war in Iraq, refuse to let that day on Al-Mutanabbi Street, and its significance, ever be forgotten.